The music, glass, and cannabis community are converging to to celebrate their niche community and culture. and we have a pair of tickets to give away! 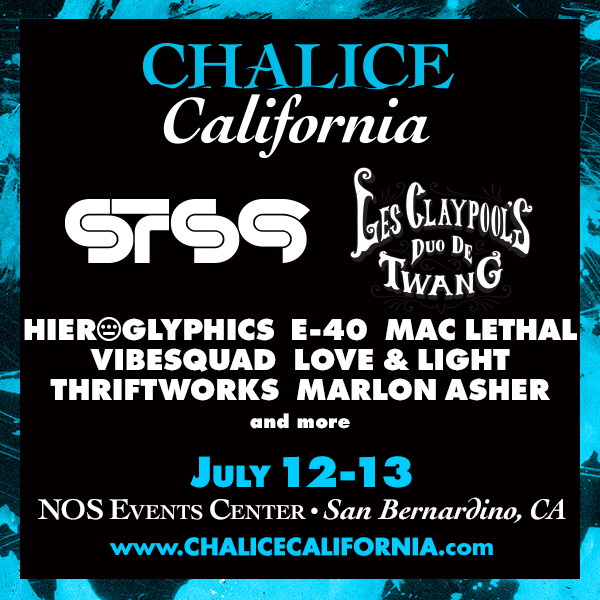 The two-day event, called Chalice California, is produced by Hitman Glass and will make its debut at the NOS Events Center in San Bernardino, CA on July 12 and July 13, 2014. The live-music aspect of the event will feature performances from headliners STS9, Les Claypool’s Duo De Twang (on their only California tour stop), Hieroglyphics and E-40, along with Mac Lethal, Vibesquad, Love & Light, Thriftworks, Marlon Asher, Highdro, and many more still to be announced. The Live Glassblowing portion of Chalice California will include Darby, Bearclaw, Pakoh, DWreck and Mr. Gray, along with Japanese Flame Blowers Akihiro Okama, Kentaro, and NORTHERNLIGHTS42a. 1) Head over to our Facebook and like the giveaway post to enter. Feel free to Share the post as well. 2) Follow us on Twitter (we’ll need to DM the winner). Retweet our tweet containing this giveaway. You can do both to earn multiple entries. It’s that simple. We’ll announce a winner July 7th. All contestants must be 18 years or older.